Herman T. Pott, the son of German immigrants, was born in Sheboygan, Wisconsin in 1895. He graduated from the University of Wisconsin as a Civil Engineer in 1916. 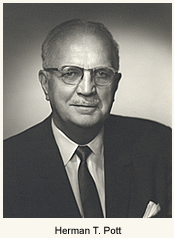 Mr. Pott was one of the 20th century's best known and most distinguished river transportation executives and pioneer river industry entrepreneurs. In 1933 Mr. Pott purchased the old Philip A. Rohan Boat, Boiler & Tank Co. in St. Louis, where river vessels had been produced since the Civil War. He changed its name to St. Louis Shipbuilding & Steel Co., and set to work developing a new enterprise. His commitment to quality and cutting-edge engineering was exemplified in his innovative manufacturing process of welding rather than riveting steel hulls and an early and strong push toward diesel propulsion technology. During World War II his company constructed ships for the United States and Russia, and by the 1950s, was the world's largest designer and builder of inland river towboats. In 1953 Mr. Pott purchased the Federal Barge Lines from the government, and built the M.V. America and the M.V. United States, the two most powerful towboats in the world. Mr. Pott expanded the company under the name St. Louis Shipbuilding - Federal Barge Lines, Inc. 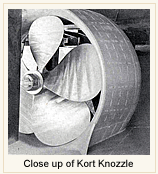 In 1967, Mr. Pott changed the company's name to Pott Industries, Inc.
Mr. Pott is also credited with the development and refinement and construction of the Kort Nozzle, a short metal tube that surrounds the propeller. The improved design increased a towboat's "push power" by more than 30% . Herman Pott's name lives on at the Herman T. Pott Inland Waterways Library at the University of Missouri-St. Louis. The library includes more than 15,000 volumes covering all aspects of the history of America's inland rivers and waterways, and dating from the beginning of inland river navigation and its development in the 1820s to the present day. Holdings also include coverage of foreign waterways and ocean navigations. Phenie Hope Ryals Pott was born in Ft. Deposit, Alabama. She moved to St. Louis in 1923 where she met and married Herman Pott. 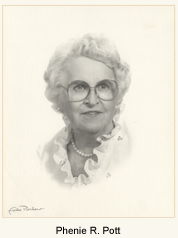 Phenie was a long time area volunteer and philanthropist. Phenie gave countless hours of her time to the Salvation Army Women's Auxiliary making purses to sell at their Auxiliary Bazaar. She also gave of her time and money to the Missouri Botanical Gardens and Missouri Girls Town.